Wearable length 7″ (including the gap)”. The warrior head panel measures 1 1/4″ tall x 1″ wide. 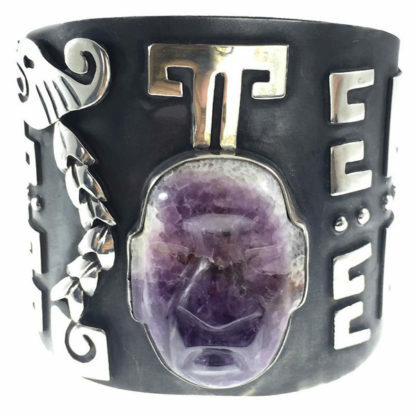 Travel back in time with this unique warrior motif cuff sterling 925 Taxco Mexico silver bracelet accented by a Greek key design and a beautiful amethyst inlay! The silver work on this gorgeous and abstract piece has been detailed by an uneven niello-darkened finish.